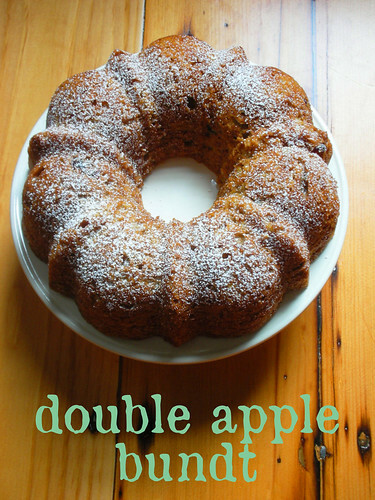 Lynne of Honey Muffin keeps the autumn recipes coming with her Double Apple Bundt pick for TWD. This is kind of a spicy sister to the Fresh Apple Cake I made a couple of weeks ago…that one was flavored with vanilla, but this one has all the classic fall spices goin’ on. This cake is “double apple” because in addition to fresh apple, it calls for a heaping helping of apple butter. Since I didn’t have nearly enough on hand, I used unsweetened apple sauce instead. I was a little worried, since they’re not really the same consistency, but as it turned out, all was fine. I also swapped out about a quarter of the AP for whole wheat flour, which these days I find myself doing probably more often than I remember to tell you about. All in all, a delicious fall cake…and it’s a good keeper, too, as it’s super-moist. For the recipe, see Baking: From My Home to Yours by Dorie Greenspan, or read Honey Muffin. Don’t forget to check out the TWD Blogroll! AI didn’t add raisins to mine, but went in a totally different direction. Love the color on your cake…and the Hollywood lighting to show her off to her best advantage. You take such wonderful photos. This was a hit here with or without a great photo! Your cake looks wonderful and your photo is beautiful! I love the cake looks with the wood background. that’s my bedroom floor (it was the only sunny-ish spot on a rainy day…hehe)! I hope you’re enjoying your new kitchen! I loved this cake – a perfect recipe for fall. Beautiful picture! I also used some applesauce, until I ran out of that, and had to finish up with yogurt. But it turned out yummy and very moist! I agree with you it was a good keeper. I had mine around for days! I love that you used some wheat flour too. I always forget! Your cake looks perfect, I love the powdered sugar on top! I like the whole wheat flour sub too…maybe Dorie will do that more in her next book??? Love the autumn recipes!! Looks marvelous, thanks for joining me this week! ive been doing the ww flour swap-in lately too. It looks perfect! I need to start swapping out a little AP for whole wheat — I bet that works particularly well in a rustic cake like this one. wholewheat and apples. sounds healthy enough! Perfect breakfast item. your cake looks delicious! so glad it worked for you with the unsweetened applesauce. I think this is the type of cake that can hold up to lots of subs! Stunning – love the powdered sugar on top too 🙂 You’re sucha good baker girl! Beautiful picture! The cake looks delicious, I love this time of year for baking. salivating over it. . Love apples! After seeing pictures of the full bundt cake version of this recipe, I almost wish I had gone that route instead of the minis. Your looks just perfect with the dusting of confectioners sugar. So simple and so delicious. good idea with the WWF. Also used a little applesauce when ran out of apple butter. STILL tasty!! This look beautiful. Apple butter is one of the tastiest things on earth!